I am quite positive the author of the problem page has b in mind. I agree b is better than c and probably also better than a. However, given proverb 3 the enemy's key point is yours, I am not convinced b is the best move on the board. DJ: Indeed, b is the solution, a gets half marks, because it is quite flat in relation to the black Shimari in the UR corner, and c is of course very bad, as it is a very cramped hiraki from an already very strong position: it is badly Overconcentrated. 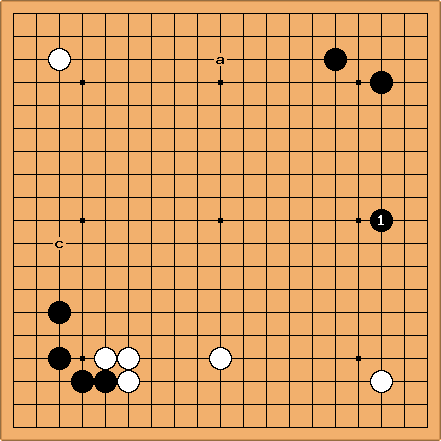 If White takes the so-called key point, Black reduces her moyo with 3. (maybe 9 better at a or b). I like Black 1 much better than Black 2, also because White's natural development in the upper left is now to the left, an area which is played out. DJ: Please bear in mind that these exercises are meant to be very basic, for real beginners. Therefore the solution may be seen as a little slow in the light of modern go. Still, such moves could be considered as Honte, the move almost all Pro would show to a kid learning the game. Speedy moves as your proposal can be appreciated later in the development of one's skills. If I may nevertheless add something, it looks to me that in the sequence you propose Black has given White solid territory in exchange for an influence somehow neutralised already by and the marked stone. 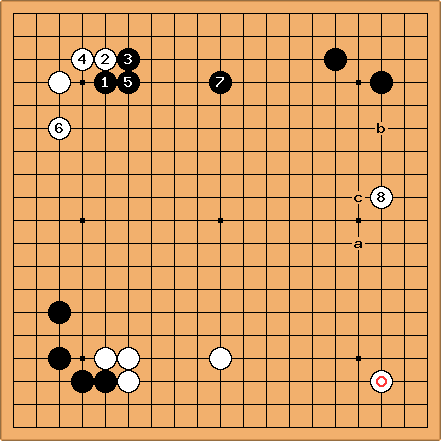 Given Black's Kakari in the UL corner, White can always take the corner with a Tsuke at c... What do you think? Dieter: If that's the way you think about it, perhaps I will have to make a stronger statement. Making two wide extensions from 3-3 is not basic, it is wrong. My diagram is a kind of "proof". Therefore, preventing it - based on the aforementioned proverb - is also wrong. Concerning my diagram, White 2 is now very badly positioned. (BTW, Yes, White's tsuke at c seems a good move to me). White 2 is a move no pro would show to a kid. It has nothing to do with speed and modern Go. White is flattened in a way much worse than the reason why a in your solution gets half marks with respect to b. (Read IMHO and AFAIC). During the short time I had a teacher, she told me it is OK to play the 3-3 point, but you should have a good plan with it. It requires deeper thinking about the opening to play 3-3. This problem, which is for Black to move and not for White, it is meant to show one basic principle: the natural development from a Shimari, and not to illustrate the proverb the enemy's key point is yours. The move a Pro would show is Black at b in the original diagram and here: how to extend from one's Shimari. Dieter: I think you accord absoluteness to the ''natural extension from the shimari" where there is none. The difference between both extensions is what ? Four points ? And how can a proverb like "the enemy's key point ..." be misleading ? 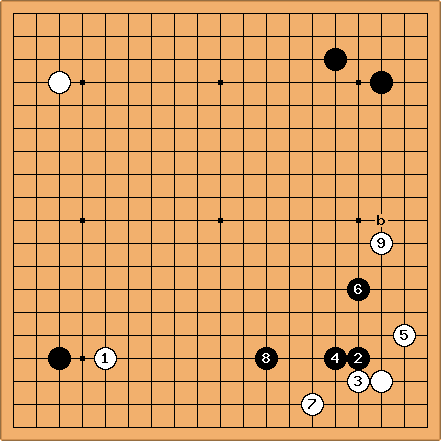 Why is a kakari a good opening move ? Because it prevents a shimari. Why is it good to move out to one side ? Because being enclosed and leave all the influence to the opponent is not good. To prove my point: If Black plays 1 in next diagram, receiving half marks from you, where would you play as White then ? Or would you advise beginners not to read two moves deep ? DJ: Oh, I am really sorry to see you jumping to strange conclusions, putting in my mouth words I have never said. 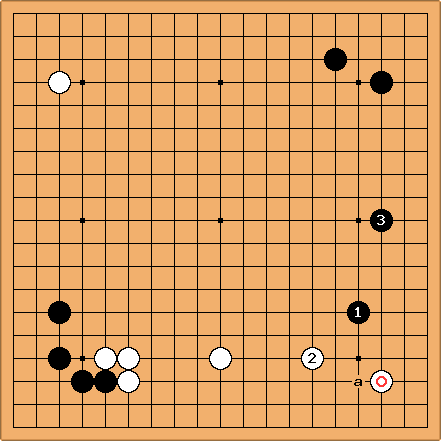 My go may be old-fashioned, but when I learnt to play, 20 years ago, extending to 1 from the Shimari in the diagram below was taboo. A Pro would have severely scolded a kid for a move that neglects so evidently the DirectionOfPlay. Black first, next White ... ? I just added the third, obviously wrong, answer (I was afraid of breaching copyright issues too much...). If the Admn. 's feel that these problems could raise copyright issues, please erase them. Bill: There is a good bit of subtlety to this position. I don't think I would use it as a beginner's problem. There is no doubt that b is the best of the three alternatives. But what about the kakaris? 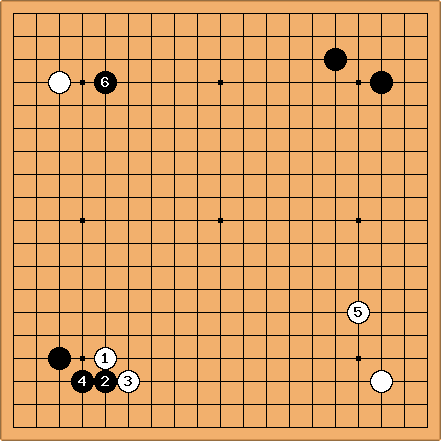 The problem with B 1 in the top left corner is that, after W 2, whichever way Black develops is toward a strong, solid position, shown by the circled Black stones. Neither White's nor Black's approach to those stones is very good, and so the kakari which prepares or prevents such an approach is not so good, either. Still, B 1 is almost as good as the solution. If the solution rates a 10, B 1 is better than 9, IMO. I like the kakari, B 1. If White's 3-3 stone were at a, a kakari would be obvious. Also, it is hard for White to play a pincer against a high kakari to a 3-3 point. Dieter: (Returning to humble mode) I was quite frustrated with the discussion, because DJ] dismissed my questions with the statement that the direction of play was evident. So I did a little research on Gobase. It turns out that three games contained the position in the right half, and one of them had a position very similar to the posted problem: 3rd Gosei title, game 3, Otake Hideo B, Kato Masao played on 1978-08-17. Maybe Otake did not play the kakari I like because it is aji keshi. Maybe Black will invade the bottom instead. If Black plays 1 here, what will White do ? If she prevents the double wing a, Black reduces her moyo with b. If she makes Bill's shimari at c, Black a makes a double wing. Bill: Two things about B 1. The extension is usually to d, one point further. And B 1 elevates the kakari in the top left, since Black is no longer so strong on top. So maybe Black is better off starting with the kakari. The joseki in the top left allows B 7 to be high, which has better balance than a low extension. Now maybe White responds at 8. 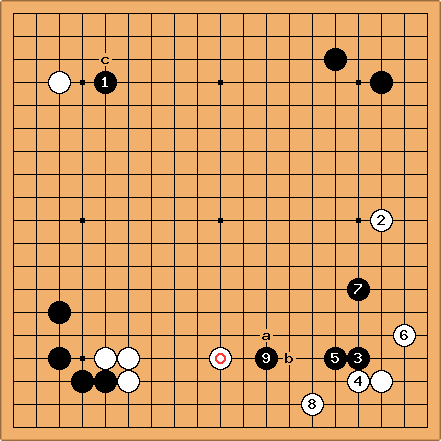 W 8 is not an extension from her 3-3 point, I think, (it's too wide), but a kind of tsume, an approach on the side to Black's sphere of influence. 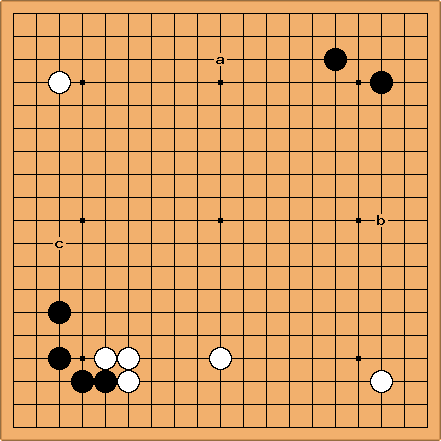 White plans an approach to b. W a is another possibility, to which Black responds at c (or maybe 8). Dieter: I am very happy with this answer. White 8, rather checking than extending was something I had in mind. So a black natural extension prevents this kind of tsume. Fair enough. DJ Dear fellow Deshi's, I do apologise if I gave the impression of dismissing (lightly?) Dieter questions. I had not that intention, I just took some time to think about it. BTW, the move at proposed by Bill here is the first that occurred to me as the answer for Dieter challenge a few dia. 's above, but being a lowly 3k, I hadn't faith enough in myself. Furthermore, I do not think I have said that the direction of play is evident here, I just thought to have said that the natural extension from a Shimari is in face of it and not to its side. Next time I'll try to explain myself better, sorry about that. Let me nevertheless express another humble opinion, perhaps OT here: I do not possess Kombilo and I do not like the idea of searching a database of Pro games to find a move that then gets labelled "the best", "perfect", "they-play-it-so-I'll-play-it-too-if-I-can-remember-it-in-real-play", or whatever else. It goes against my personal idea of studying this beautiful game.